As promised, there is a batch of scientific studies here which look at temperature trends in Iceland and Greenland, and in particular at the abrupt end of the warm period, that began in the 1920’s, and the onset of the sea ice years. The paper gives this graph of temperatures for Reykjavik, Stykkisholmur and Teigarhorn, from 1873 to 2002. The abrupt change to colder conditions in the 1960’s is clear. The warming was non-uniform in time, occurring in three distinct phases, approximately from 1880 to 1900, from 1925 to 1940, and from 1983 to 2001. Warming was most rapid in 1919–33, reaching the maximum temperatures over the entire record in 1939 and 1941. The northwestern European records surveyed do not indicate any significant trends over the 1901–30 standard period, whereas Icelandic trends are highly significant , somewhat indicating a decoupling between the Icelandic and northwestern European climates. The 1990s was definitely not the warmest decade of the 20th century in Iceland, in contrast to the Northern Hemisphere land average (Houghton et al., 2001). It was cooler than the 1930s by 0.45 °C for Reykjavik, 0.41 °C for Stykkisholmur and 0.16 °C for Teigarhorn. In an analysis of Greenland temperature records, Box (2002) lists 1939 and 1941 among the five warmest years and 1907 and 1983 among the five coldest years for the nearest site to Iceland, Tasiilaq, southeast Greenland. This is consistent with the results from Reykjavik (Table IV). Furthermore, this is consistent with the often-cited temperature dipole between Greenland and northwestern Europe (e.g. Van Loon and Rogers, 1978). Thus, 1941 was one of the coldest years of the 20th century in northwestern Europe, e.g. Copenhagen, Oslo, Stockholm (Table IV). 1983 was the 11th warmest year in Copenhagen, 13th warmest year in Oslo, and 18th warmest in Stockholm. The Icelandic cooling from the 1940s to the 1980s is in broad agreement with a general cooling between the late 1950s and the 1990s observed in western and southern Greenland (Przybylak, 2000; Box, 2002; Hanna and Cappelen, 2003) and also agrees with the P.D. Jones/Hadley Centre data shown in Serreze et al. (2000) of a widespread cooling (or at least muted warming) over southern Greenland, Iceland and the northwestern North Atlantic. These regions experienced a prolonged and deeper mid-20th century cooling when compared with the global warming trend (e.g. Houghton et al., 2001). The contrast is attributable to variations in the intensity of the Icelandic low and is thus linked to the NAO. The patterns of warming and cooling in Iceland were not always well correlated with similar changes in NW Europe, indeed often the opposite. This automatically renders any attempt to homogenise Icelandic temperature data with stations hundreds of miles away in NW Europe utterly meaningless. The sudden cooling in the late 1960’s in Iceland was part of a much wider phenomenon, and certainly applied to Greenland, where similar GHCN adjustments have been inflicted. The second paper, “One Hundred Years in the Norwegian Sea”, by Bob Dickson & Svein Osterhus, looks at events further east, towards the coast of Norway. They have this to say about the great Salinity Anomaly. During winters of the 1960s the leading mode of wintertime atmospheric pressure variability in the sector under discussion, the North Atlantic Oscillation (NAO), evolved to its extreme low index state in an instrumental atmospheric record of over a century’s duration (Hurrell 1995; Hoerling et al. 2001), and possibly much longer (e.g. Cook et al. 2002; Luterbacher et al. 2002). With anomalously high pressure persistently dominant over Greenland, a record northerly airflow swept the Norwegian Sea/Greenland Sea bringing an increasing proportion of polar water south to the seas north of Iceland in a swollen East Greenland Current. The East Icelandic Current, which had been an ice-free Arctic current in 1948-1963, became a polar current in 1965-1971, transporting drift ice and preserving it (Malmberg 1969). Aided by active ice formation in these polar conditions, the Oceanic Polar Front spread far to the south-east of normal, with sea ice extending to the north and east coasts of Iceland. This large increase in the southward transport of ice and freshwater by the East Greenland Current, preserved by the suppression of winter convection north of Iceland, passed out to the open Atlantic through Denmark Strait in the late 1960s, and was traceable thereafter as the ‘Great Salinity Anomaly’ (GSA) around the subpolar gyre for over 14 years until its return to the Greenland Sea in 1981-1982 (Fig. 10) (Dickson et al. 1998). They go on to say. However, the GSA is certainly one of the most dramatic events of the century in the Norwegian Sea. Ecologically too, the GSA was a quite exceptional event. Jakobsson (1992) concluded that ‘the ‘‘Great Salinity Anomaly’’ has probably generated more variability in fisheries during the last quarter of a century than any other hydrographic event in recent years’. During its passage, Cushing (1995) found a significant reduction in recruitment in 11 out of 15 deepwater fish stocks examined. Further, as its harsh conditions closed down the ‘warming in the North’, they also established a ‘veritable desert’ for Calanus finmarchicus [that herring feed on] in waters north of Iceland (Dragesund et al. 1980; Jakobsson 1980), and set in train a change in the migration pattern of Norwegian spring spawning herring in the Nordic Seas that has taken 35 years to unfold (Vilhja´lmsson 1997; Holst et al. 2004). So we learn again that this event affected a much wider area than Iceland itself, and that it had major consequences for the region. In the mid-1960s, large-scale physical changes took place in the seas north of Iceland. These physical changes had ecological consequences that led to the loss of the herring’s main food supply. The air and water temperature records show a similar pattern. From 1920 until 1965, relatively warm conditions prevailed over the northern North Atlantic. In 1965, a sudden change occurred; drift ice and polar water covered the north Icelandic shelf during spring. The following years until 1971 were generally cold, with sea ice and polar water frequently visiting the shores. Warmer conditions subsequently returned, but climate variability also became greater and the average salinity remained below earlier levels. Since 1997 the flow of Atlantic water to the north Icelandic shelf has increased, making salinity levels almost as high as they were prior to 1965 (Jónsson and Briem, 2003). The late-1960s episode of cold air temperatures and cold, low-salinity water, marking the passage of GSA’70s, had ecological and human consequences. The paper offers us a reminiscence of someone who lived through these times. The idea that these abrupt changes never took place is frankly ludicrous. But the Modelled Output says they can’t possibly have happened and as we know Models Trump Reality all the time as far as Climate “Scientists” are concerned. They are a dsigrace to Science and bring it in to disrepute. I’m sure many of us would like Nick Stokes to pop by so he can tell everyone they’re wrong and that there was obviously an error with Icelanders. There is indeed something rotten in the (former) state of Denmark. The importance of this essay lies in two realms. First, the authors are not just laymen; they are trained observers and provide measured data for assessment. Second, this is not ancient history. All of this took place while I was in secondary school and university. Changes in the data are not justified. The fact that ecological changes occurred during the same period fortify the atmospheric and salinity observations. What really is illustrated is the fallacy of a “global average” temperature. Climate is regional. The established concepts of continentality and maritime variability, coupled with latitudinal influences still explains a great deal of observations. It is sad that most of the current batch of atmospheric physicists, statisticians and computer modellers never read climate history and pay no attention to geology. But all you’ve shown is verifiable records from the actual period in question, with quotes from scientific and academic records of the day, and then just linked these to anecdotal reminiscences from people that happened to be alive in the area at the time — hardly a robust and full scientific case, eh? Where are your preconceived notions mixed with wild speculation for the cause and causality? Where are the poetic words of innuendo and oblique allusions to assist with generating that persuasive sophisticated literary line. A line upon which the concensus of ‘climate science’ can congregate around, and through the wonders of echo-chamber groupthink, build evermore alarming scenarios with elegant, imaginative, and persuasive sophistry. The worst of it though, is you have provided no computer modeled graphics projecting future catastrophe for headline grabbing self gratification. From this I can only conclude that your case is not proven, and is mere conjecture. Be assured that with science like this you will never rise to the hights of J. Hansen, or even the mighty M. Mann. You said it much better than I ever could! Would that we all were as brilliant as Mann! Any guy that can be caught manipulating data, deleting data sets, using a blatantly fraudulent algorithm, and still be listened to has all my respect! Hansen more so… Coal in box cars is like Jews to the furnace… And he still has a job at NASA where he gets to lie and fiddle with climate history even after being caught discussing his lies in emails. Dudes are bullet-proof charlatans. We should all seek to be like them. Paul, one thing that I have noticed is a severe lack of reporting of your finding at both WUWT & Climate etc. Whats up with that, why are they not discussing it? Might have some news tomorrow. If you need anything wrt Judith, please ask. Most of my guest posts tackle bad climate consequences papers, Marcott 2013 being yue exception. You are providing solid evidence of problems at the observational base of the underlying ‘science’. This post is another showing among other things the folly of regional repectations. Highest regards. Slightly OT, but in 1922 it must have been warm enough to swim in the sea off spitzbergen – sea temps of 15deg! Some thing to do with teh gulf stream perhaps? Out of curiosity, I went to the Icelandic Meteorological Office website to see if I could find data for the three stations mentioned in the Hanna et al. figure, to see what the temperature did after 2002. Anyone interested in the result can see the graph here. What happened to pre 1950? You can get that data – longer series for selected stations – here, but they don’t run all the way to 2014, and I didn’t know if I could combine/splice with the 1949-2014 data sets. I just wanted to have a quick look and figured this pre-1950 information was already in the graph you posted at the top of your post. It’s worth pointing out that you went through all this in great detail about 3 years ago. See the list of related posts. It was drawn to the attention of the adjusters at GHCN, who said they would look into it, but clearly have done nothing. Interesting analysis! 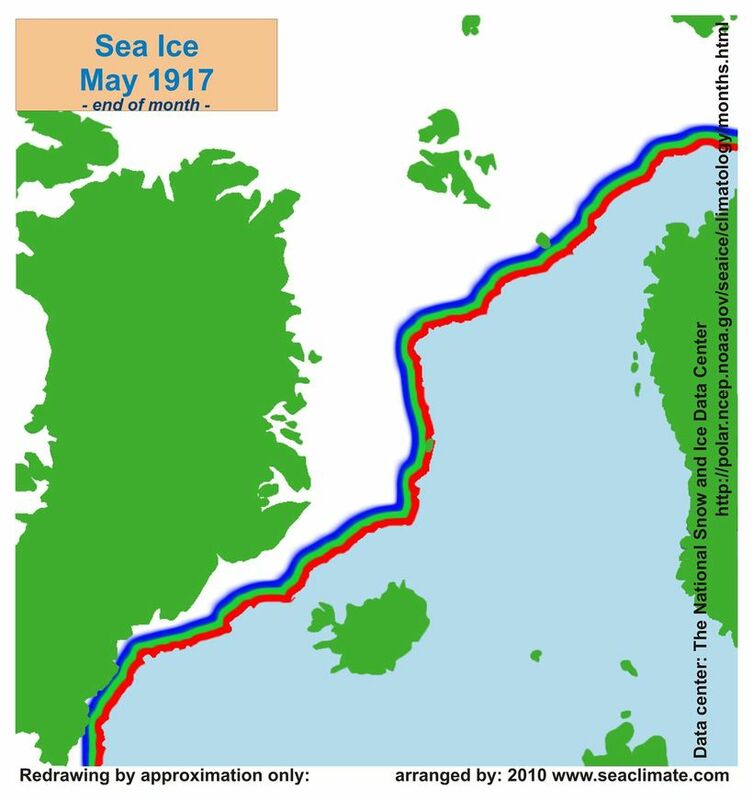 Here is a chart of the sea ice from May 1917 – http://www.arctic-heats-up.com/_ADD/b/z_3.jpg – a year when the sea ice extent was also at a high level. I would love to know who the 99% of the scientists are who, according to the current Administration and the global warming money-makers, say that global warming is real and here. Who are these 99% of the scientists? Are they meteorologists, or astronomers, or gynecologists or what? This statement is not only beyond reality but also beyond the limits of statistical error. People are so stupid.